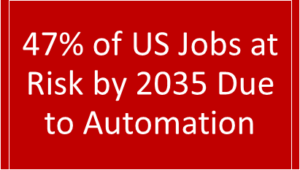 Automation has been impacting work in the United States for over 100 years. The Kennedy Administration pointed to the impact of automation impacting the manufacturing sector starting in the 1950s. Industries like textiles figured out how machines could replace humans and produce higher quality products for less money. Occupations with the highest chance of being automated involve work that involve highly predictable physical activities as well as collecting and analyzing data. Thus, occupations are more likely to change than be automated away. Advances in computer software and the development of artificial intelligence is giving computers the ability to learn while the cost and ability of robots is making them more and more common place in the manufacturing sector. By 2035, 47% of U.S. jobs might be at risk due to advances in machine learning, automation, and artificial intelligence according to a recent White House report. McKinsey estimates that almost half the activities people are paid almost $16 T in wages to do in the global economy have the potential to be automated through existing technology. This may impact 2,000 work activities across 800 occupations and 60 M U.S. jobs. Again, McKinsey estimates less than 5 % of all occupations will be fully automate, but about 60 % of all occupations have at least 30 % of constituent activities that could be automated. Recent research suggests that the effects of AI on the labor market in the near term will continue the trend that computerization and communication innovations have driven in recent decades. Researchers’ estimates on the scale of threatened jobs over the next decade or two range from 9 to 47 %. For context, every 3 months about 6 % of jobs in the economy are destroyed by shrinking or closing businesses, while a slightly larger percentage of jobs are added—resulting in rising employment and a roughly constant unemployment rate. The economy has repeatedly proven itself capable of handling this scale of change, although it would depend on how rapidly the changes happen and how concentrated the losses are in specific occupations that are hard to shift from. Jobs threatened by automation are highly concentrated among lower-paid, lower-skilled, and less-educated workers. [i] Automation will continue to put downward pressure on demand for this group, putting downward pressure on wages and impacting economic inequality. [ii] Predicting the future is always challenging. Some economist see a superstar-biased technological change, where the benefits of technology accrue to an even smaller portion of society than just highly-skilled workers. [iii] Economic consolidation in the tech sector is also a concern as a few large, global technology companies are able to dictate economic terms to businesses and consumers but that concern has existed through every economic transformation. However, there is no crystal ball needed to predict that workers with training in the Science, Technology, Engineering and Math (STEM) fields will be the best prepared for economic opportunity created by the Automation Revolution. The impact of automation involves not just the loss of jobs but also the loss of wages to individuals and a region. Again, predictions about job and wage loss are based upon the current knowledge of what technology is capable or not capable of doing. Also, as the table below illustrates, different regions who operate with a different economic make-up will all have their own reaction to the Automation Revolution. The loss of jobs is not the only economic challenge coming from automation. Of even greater concern is the loss of wages. The chart below illustrates the higher wage occupations at risk in Ohio cities based upon the Automation Revolution and, again, shows how different communities may be impacted differently. As the tables above both illustrates, the Automation Revolution is slated to change the future of work for thousands of Americans who are working today successful in a range of industries. These jobs will be in both low wage, service oriented professions as well as high-wage services jobs in financial services, government and professional service categories which have been growing in number over the last several decades. Lessons learned from the loss of manufacturing jobs provide some but not total insight on how automation will impact regional economies. As the productivity increased in industries such as manufacturing, total manufacturing jobs has been on the decline but wages for those remaining workers moved up right along the same path. Thus, while there were fewer jobs in the manufacturing sector since the 1950s, wages for the workers left in those industries has risen. The wage gain in the manufacturing sector was large enough to support overall economic growth, and many workers were shifted to lower wage, lower skilled occupations and other industries blossomed in the place formerly held by manufacturing. As an example, as the manufacturing sector has dropped in its number of jobs, health care, financial services and retail have taken those workers with lower to mid-level skills. 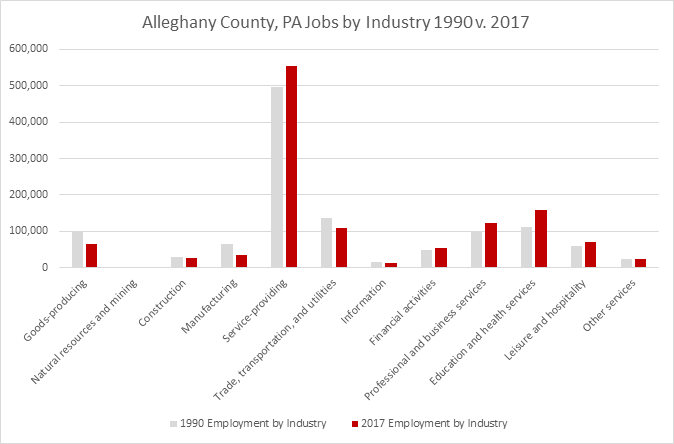 As the table below illustrates from Alleghany County, Pennsylvania, home of Pittsburgh, there has been a major job loss in the goods producing and manufacturing industries in this major industrial center. Alleghany County is considered by many an economic success because it has transferred those workers that in the past would have been in manufacturing to growing sectors in professional services, health care, education, financial services and leisure and hospitality. Pittsburgh’s economic transformation illustrates how formal global industrial manufacturing centers have survived and, in fact, thrived in a new, competitive global economy. Pittsburgh’s transformation has not been an accident. Regional, state and national leaders worked to transform Pittsburgh from a steel town to a technology and health care centers. Institutions like Carnegie Mellon University, University of Pittsburgh and others became more important players in the region’s economic future. The transition was not easy and painful at times, but Pittsburgh illustrates how a region can begin to recover from dramatic shifts in an industry and the resulting loss of thousands of high-wage jobs. The challenge automation bring today is that this job and wage loss is going to hit several job and wage rich industries all at once. The Alleghany County chart above illustrates the industries that have taken the place of manufacturing in many former industrial centers are prime targets for automation and likely to enjoy substantial job losses.